Probo the huggable robot platform. Robotics & Multibody Mechanics R. G.
Probo is an imaginary animal type with an own identity, including a name, a history and also friends and family. 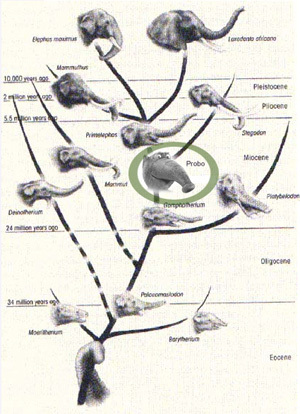 The name Probo is derived from the word proboscidea. Proboscidea is an order that now contains only one family of living animals, Elephantidae or "the elephants", with three species (African Bush Elephant, African Forest Elephant, and Asian Elephant). During the period of the last ice age there were more, now extinct species, including a number of species of the elephant-like mammoths and mastodons. In the name Probo we can also see the word "ROBO" which emphasises the robotic nature of Probo. The robot is about 80 [cm] heigh and will recognize the childrens emotions on the one hand and shows its own emotions making use of facial expressions, gestures and speech. The main aspects are a huggable appearance, an attractive trunk or proboscis, animated ears, eyes, eyebrows, eyelids, mouth, neck, and an interactive belly-screen. The internal mechanics of the robot are placed inside a plastic housing and covered with a foam layer and a removable fur-jacket, in such a way that Probo looks and feels like a stuffed animal. The colour of the robot is green, this colour evokes mainly positive emotions such as relaxation and comfort. The recognition of facial expressions using the virtual model of Probo was tested in different user-studies. The results showed that the recognition of the emotional states of Probo are very good with an overall identification rate of 88 %, especially by children.